StonePly is a thin, lightweight natural stone cladding made up of granite, marble or limestone bonded to an aluminum panel with a honeycomb core. 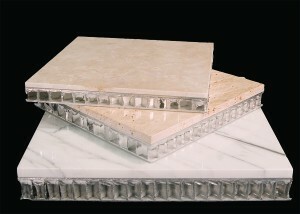 StonePly is stronger, lighter and easier to attach to the building than slab stone. In addition, StonePly performs very well in fire exposure conditions. 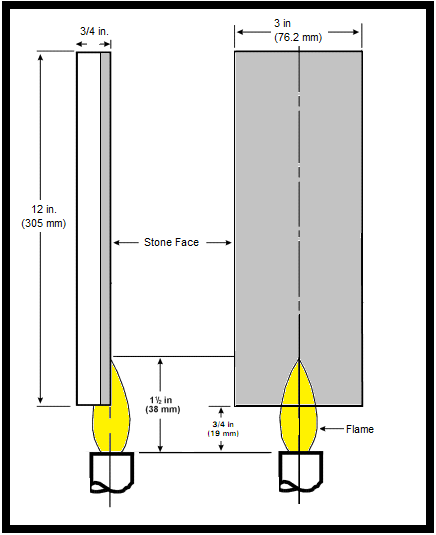 StonePly has a non-combustible, 0 flame spread surface on both the front and back surfaces. It performs very well in fire testing. StonePly meets the European standards for cladding materials and is considered a non-combustible cladding. The main raw materials for StonePly are non-combustible stone and non-combustible aluminum along with a small amount of epoxy adhesive. EN 13501-1: Fire classification of construction products and building elements – Part 1: classification using test data from Reaction to Fire test. The Reaction to Fire Test determines whether a material will burn and add fuel to a fire. 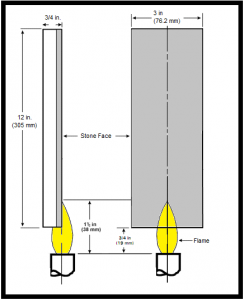 EN 13501-2: Test for Fire Resistance of construction elements. Fire Resistance indicates how well a building assembly can resist a fire and prevent it from penetrating the assembly (wall, roof or other assembly). EN 13501-1: Fire classification of construction products and building elements – Part 1: classification using test data from Reaction to Fire is a material test. Under this test, StonePly achieves a Class A: No significant contribution to fire growth. EN 13501-2: Test for Fire Resistance of construction elements is an assembly test. The Fire Resistance test indicates how well a wall, roof or partition can hold back the fire and prevent it from penetrating. This is not a test of just the wall face or wall cladding, but of the entire wall or roof assembly. I Load-bearing capacity (the ability of the building element to maintain strength and stability of the building system over a period of time). This concerns mainly roof elements.Integrity (the ability of the building element to remain intact, even if the surface temperature is at a critical level)Insulation (the ability to keep the temperature lower than 140°C on the unexposed side), expressed in minutes. A wall assembly fulfilling all these basic criteria for 90 minutes will be classified REI 90. Depending on the materials used in the wall assembly, walls constructed with StonePly can range from 60 minutes to more than 240 minutes Fire Resistance. While the EU standards are uniform, interpretation of the standards varies and is still a somewhat local process. Several jurisdictions limit the use of combustible materials in wall cavities. There have been several cases of multistory fires where the cladding had a non-combustible face, but a combustible backing. Fire was able to spread through the drainage gap behind the cladding. Unlike some composite panels, StonePly utilizes a solid sheet of non-combustible aluminum as a backing for its aluminum honeycomb core. 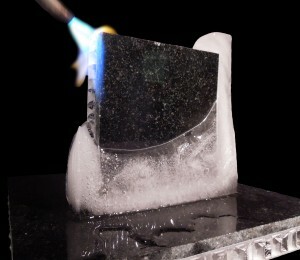 This provides a 0 flame spread on both the inner and outer face. For more information or assistance visit www.StonePly.com or contact us at 903-454-4630.